Shipham Players proudly present a traditional family Pantomime – with lots of fun, singing, dancing, audience participation and a bit of slapstick thrown in. As with all pantos, there is a Dame, a heroic Principal boy and a beautiful Heroine, a nasty Villain- boo,hiss! – comedy characters, and many more besides! Oh – and a couple of animals! This Panto promises to be our best yet, with plenty of colourful scenery, special effects and imaginative lighting. A cast of over 40 local people of all ages have been busy rehearsing to ensure you have the best panto experience. Oh yes you will! 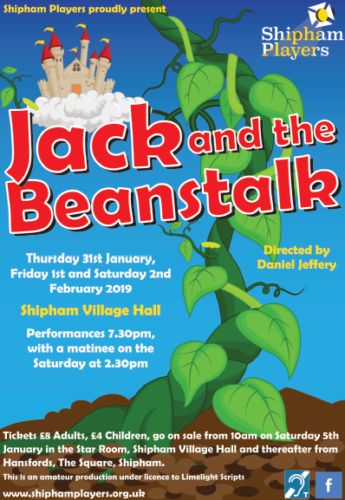 Jack and the Beanstalk will be performed at Shipham Village Hall on Thursday 31st January, Friday 1st and Saturday 2nd February 2019, at 7.30pm with a matinee performance on the Saturday at 2.30pm. Tickets will go on sale from 10am on Saturday 5th January at The Star Room, Shipham Village Hall and thereafter from Hansfords, the Square, Shipham. Unfortunately, there are no telephone or online booking facilities.